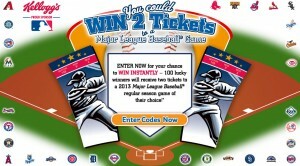 There will be a total of 100 winners that each get 2 tickets to a 2013 Major League Baseball regular season game of the winner’s choice. You’ll have until July 31st to enter this one. Good luck! wish there was a way to copy and paste codes from your posts. I have to type all that out. UGGH. ha. Helpful Hint – open a search box via control F and type the code in that box…..you can copy paste and take it to the next page instead of going back and fourth…..